Use this website to quickly find the most important information about Riyadh King Khalid International Airport or KKIA Airport: Flights (Departures, Arrivals and Delays), Parking, Car Hire, Hotels near the airport and other information about Riyadh airport. 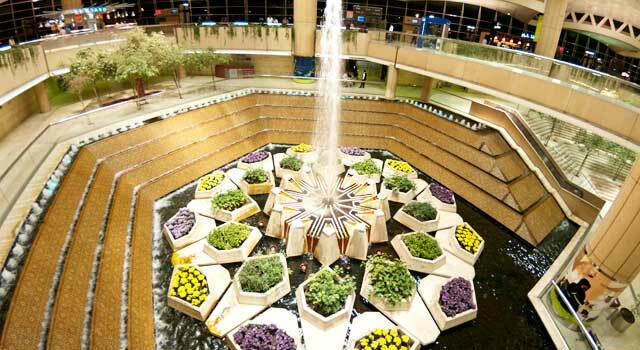 Plan your travel to RUH Airport with the information provided in this site. Riyadh King Khalid International Airport (IATA: RUH, ICAO: OERK) is located 35 kilometers (22 mi) north of Riyadh, Saudi Arabia. 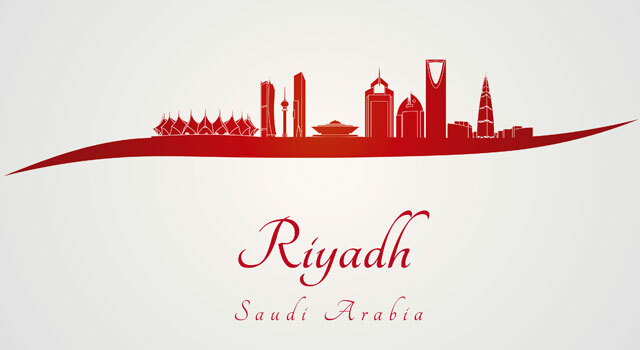 The airport serves the city of Riyadh, the capital of the country. Is the second biggest airport in Saudi Arabia, after Jeddah airport. There are currently 40 Airlines (approx) that uses Riyadh Airport for scheduled passenger service. These airlines offers a wide range of destinations in all over the world. The airport is considered as the major air gateway for the Kingdom of Saudi Arabia. This airport was built to handle the increasing local and international air transport requirements for Riyadh. 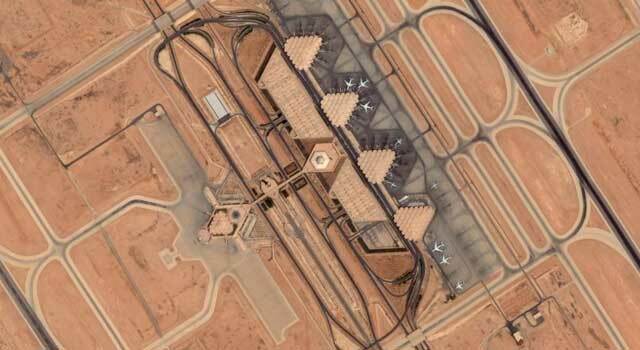 The airport that KKIA replaced, Riyadh Airport, is currently a Royal Saudi Air Force airbase. The passenger number handled by Riyadh King Khalid International Airport is increasing every year. In 2017, 24.8 million passengers used the airport. In 2016, the airport handled more than 22 million passengers. At Riyadh Airport there are 3 operative terminals: Terminal 1, Terminal 2 and Terminal 5, together with the Royal Terminal. Terminals 1, 2 and 5 are connected to each other by walkways. The complex has different facilities as cafés, restaurants, hotels and rent-a-car companies, banks, medical assistance and shops, among other services. - Terminal 1: This is the international terminal excepting for flights by Air France, Saudia and Nas Air. - Terminal 2: International flights by Air France, Saudia and Nas Air are hosted in this terminal. - Terminal 3 and Terminal 4: Terminal 3 and Terminal 4 used to operate domestic flights. They are currently inoperative, although both are being redesigned to increase the passenger capacity. It is expected they will be operative by 2019. Three linking buildings connect the terminals with lots of facilities and services. The land area allocated for this airport is among the largest in the world. To get around from and to Riyadh Airport there are various options. Please note that women are allowed to drive from June 24, 2018. - Car Rental: various agencies provide car rental service. Check the best option for you here. - Shuttle Service: various hotels located in the vicinities from the airport offers free shuttle service. It is recommended to ask to your hotel to know if it is available the service for you. - The Central Control Tower is one of the world's tallest. 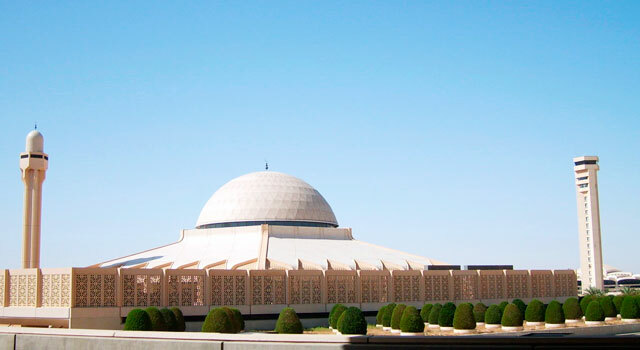 - The Royal Terminal is only used by the Saudi Royal Family and the Kingdom Guests. - There is a current expansion in the airport to increase the capacity to 30 million passengers and to built a new terminal. - There is a mosque, 4 Terminals and 2 runways. - The mosque is the most important structure on the airport.